Maternity clothes? Quite often, though my skirts and dresses are non maternity (and I love them!). Best moment this week: Our baby shower on Saturday! It was so much fun and everyone was so incredibly generous! Movement: All the time and I love it! Food cravings: I still love apples and milk every day. I’ve also been eating some leftover chocolate cake from my shower — it is so yummy! Belly Button in or out? Still in, though I’m actually thinking it may pop out. Eek! Weekly Wisdom: Don’t worry about things you cannot control — they won’t always go poorly. Milestones: Baby is head down! Baby shower. Oh, and I dropped! Okay, I really want to point this out. Since this is my blog, I can do so. 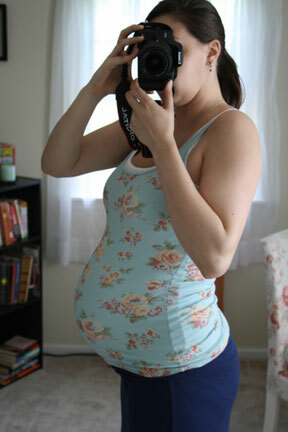 :) When I took my 30w photos, I noticed my arms were getting big. Ugh. I said, “It’s time to start working them out a bit more” (I wasn’t really doing much of anything with them to be honest). So I did. I just want to say that the last month has been great for my arms! I’ve been doing weight training every other day, and it is paying off! You can see the difference in the belly comparison pictures above. I’ve also seen a bit of sun, making me not so pale looking, which is nice. So there’s my brag for the day (ha!). Love that you called out the difference in your arms! You’re giving me motivation that I just need to do it! Looking great mama!